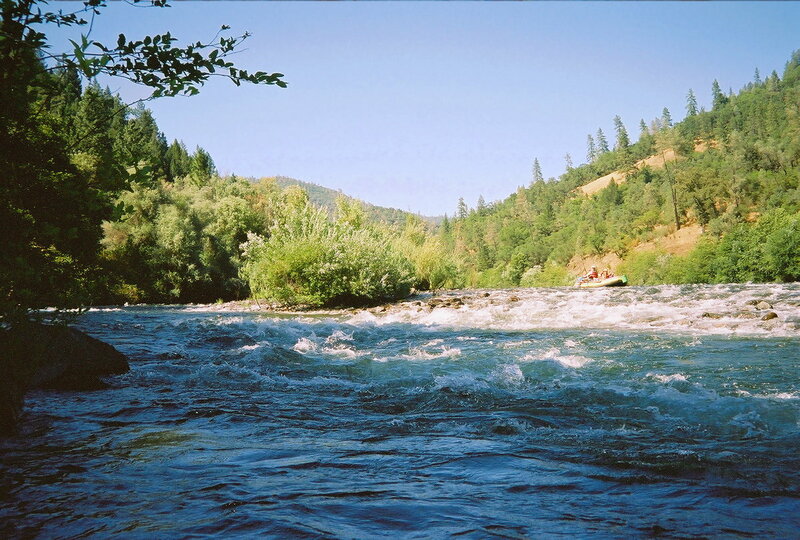 This is a good beginner run in mid to late summer, when other rivers have lost their natural flow. Boaters encounter a fun class II or II- rapid every few minutes, it seems. An added bonus is proximity to population centers. 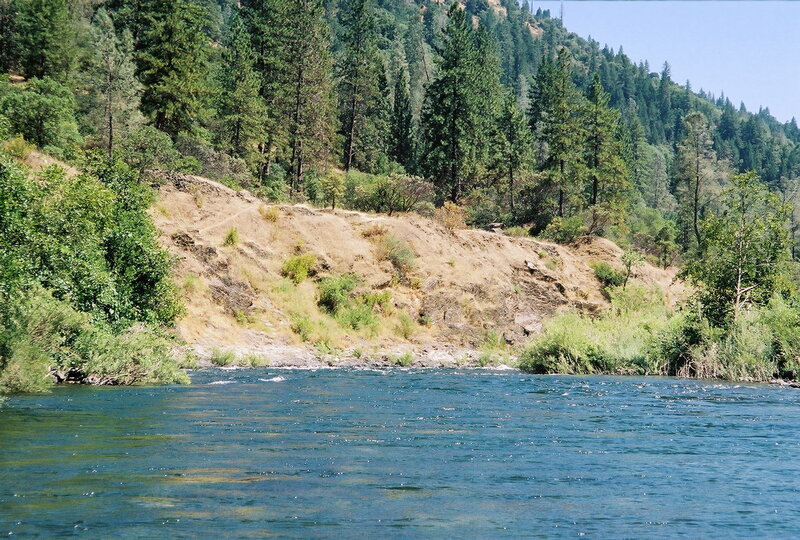 With few people on the river, and being well away from any road, this section has a nice wilderness feel. Moreover, the blackberry harvest is bountiful in mid to late summer. The one downside is the rough dirt-road shuttle to put-in. 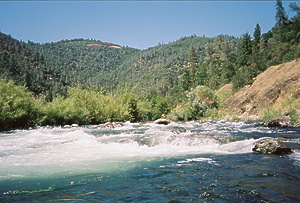 Although this run has one class III feature and many class II rapids, they are all relatively wide-open and unobstructed. These traits, combined with minimal brush hazards, make this run safer than some others, including the lower Stanislaus and Putah Creek, for an out-of-control beginner. In wet years Oxbow powerhouse releases 1150 cfs around the clock, except for occasional unpredictable days with no release. In drought years there are additional days without releases, often Sundays, and power generation starts in early morning, rather than going all night. Higher water takes about 5 hours to travel 16 miles to your put-in. If you check the OXB flow on the web shortly before driving to the river, you are virtually assured of adequate water. Note (2008): Unfortunately, the Mammoth Bar access is closed certain days for everyone. Previously it was closed for motorized vehicles but open for river access. Currently the park is open from April thru September (summer) only on Thursday, Sunday, and Monday. From October thru March (winter) the park is also open on Friday. 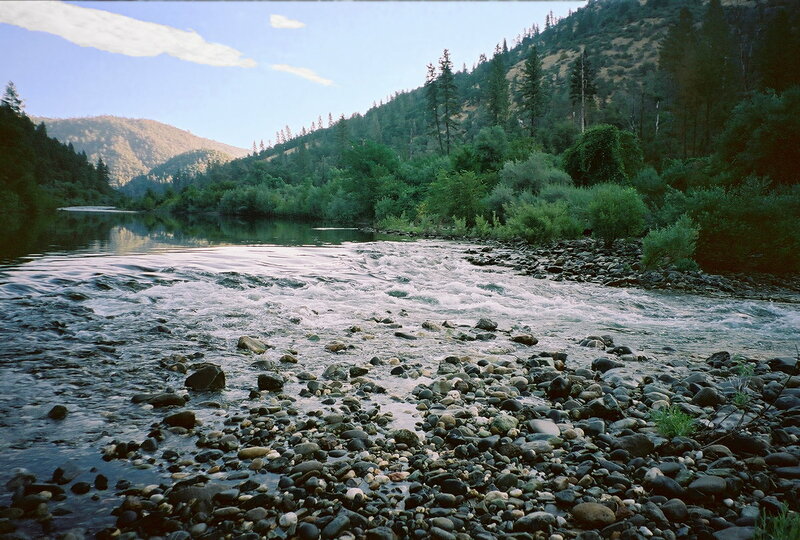 If the Mammoth Bar access is closed, you will have to portage Murderer's Bar (directions below) and somehow negotiate a class III-IV drop just above the north fork confluence. 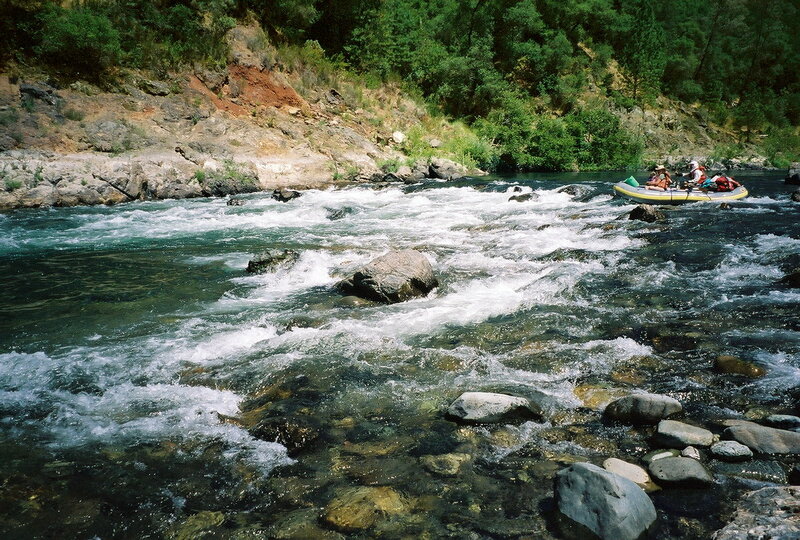 We've done this run (down to Murderer's Bar) quite a few times in canoes, hardshell kayaks and IKs. 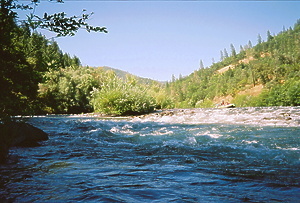 At typical 1150 cfs summer flows, there are about 5 class II rapids in the upper half, with just a few play waves. About a third of the way into the run, there is a big hole on river left. It's very easy to miss on river right, even without scouting. This run is not for the beginning canoeist: some whitewater skills are required. 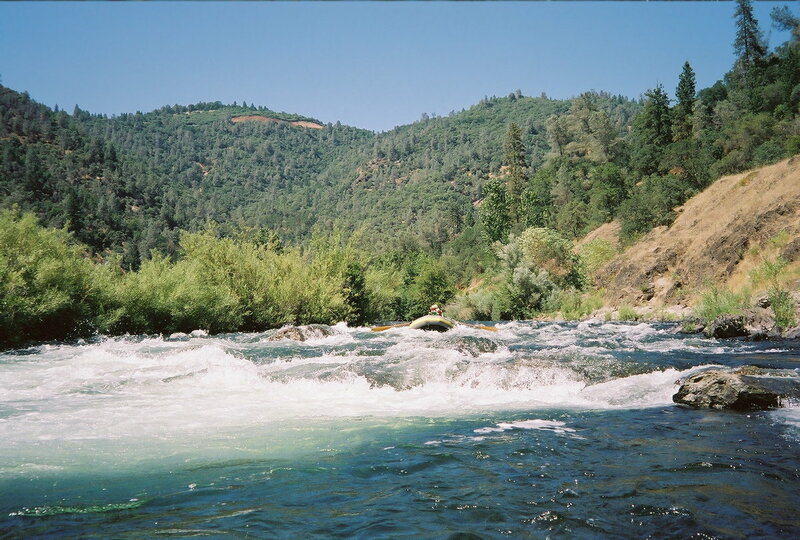 However, it is a great run for a solid beginning kayaker -- easier than the lower North Fork. I've taken a first time IK paddler down with nary a mishap. In the lower half, there are a few easy wave trains. 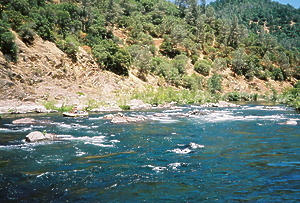 The pools flatten out and afternoon upstream winds sometimes slow your progress, although I remember at least one class II. With a leisurely lunch, it makes a great day and seems far longer than the mileage suggests. 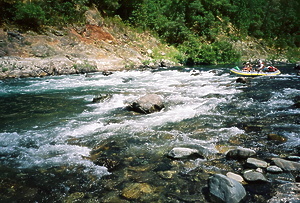 The run immediately upstream, a great commercial rafting run, is described in the Tunnel Chute writeup. 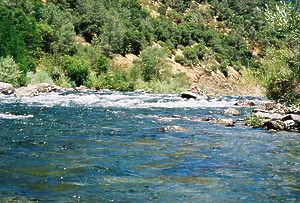 The run downstream, with whitewater park opened in 2008, is described in the Auburn Dam site writeup. Note that this entire run would have been drowned if Auburn Dam, planned in the 1960s but abandoned after discovery of a nearby earthquake fault, had been built and filled. Put in at the site of former Greenwood Bridge, which was washed out when Hell Hole Dam failed far upstream during the winter of 1964. This dam has been rebuilt with the same design and could fail again, hopefully not in the summer while you are on the river. American Canyon creek enters on the left. 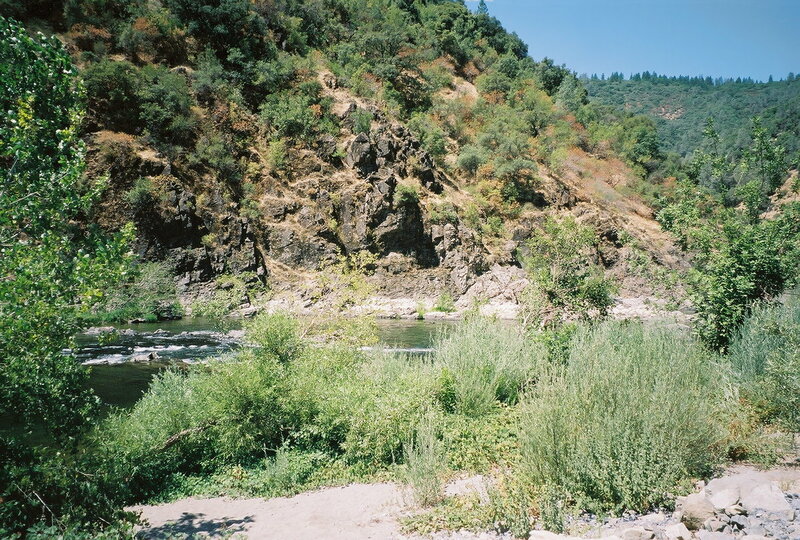 This was the site of a large settlement during the gold mining era. 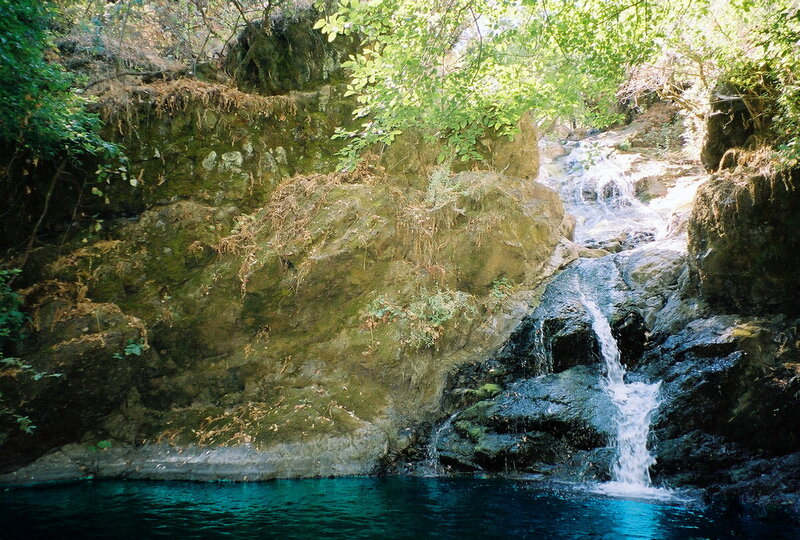 Good swimming holes and a scenic waterfall upstream. The Ledge, class III on the left, class II+ on the right. Enter in the center and move to river-right at the bottom. Maine Bar creek enters on the left. Brown's Bar Canyon enters on the left. Mammoth Bar on the right bank, where you might see clouds of dust and hear the roar of dirt bikes. This is a Bureau of Reclatation multiuse area. 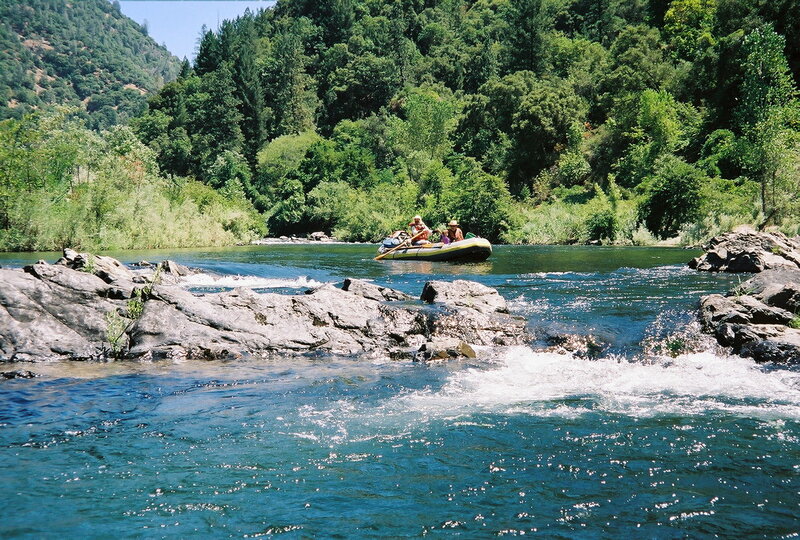 Do not blunder downstream into Murderer's Bar rapid! "As you approach the entrance to Murderer's Bar, most of the current runs river left into a narrow channel that forms the rapid. To the right of this channel through the rocks, you can see an intimidating metal grating wrapped onto the rocks. Right of this, near the right shore, is a small 3' gap between rocks with a little current at the typical 1100 cfs flow. Pass through this gap into a small pool where you can safely exit your boat. From here it is possible to clamber down among large boulders and eventualy lower boats 10' down a rounded boulder into a shallow still pool, from which you can safely re-enter the main channel below the class-V crux section. Some fun drops remain." 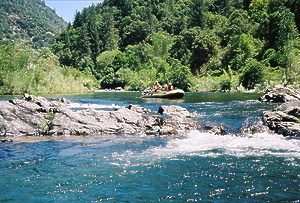 Class III-IV rapid, the hardest on this run (except for the portage). Confluence of the north and middle forks American. Highway 49 bridge, last good take-out before Auburn Dam construction site, and after many miles, Folsom reservoir. 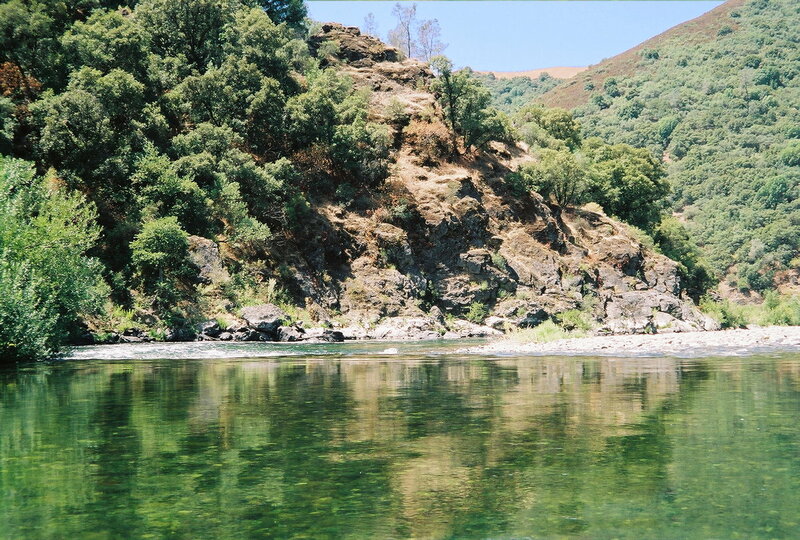 To reach take-out, take highway 49 south from Auburn and descend three miles to the river. Just before crossing the bridge, turn left onto Old Foresthill Road. This is an alternate take-out that simplifies your shuttle but requires a portage around Murderer's Bar Rapid. Continue about 1.5 mile to Mammoth Bar Road, turn right, and follow this dirt road about a mile to the river. To reach put-in from there, return to Old Foresthill Road, turn right, and continue another 5.5 miles (7 miles from highway 49). Turn right onto Driver's Flat Road, and follow this dirt road about 1.5 mile down to the river. Greenwood Bridge site can also be reached from Foresthill via McKeon Way, a dirt road that is longer but less steep than Driver's Flat Road. To find nearby food and lodging, type Auburn into the box and click Search. I did this run [late July 2001] with two friends in a Coleman Scanoe. We put in at Ruckachucky campground and took out at Mammoth Bar. The flow was pretty low (not sure of exact volume), which required some careful maneuvering in several rocky areas. I'd say that we went though at least ten sets of rapids that were above class one because of the maneuvering that had to be done. Both of my friends were pretty heavy and without much experience. I was in the back and happen to be the lightest, so we were a bit nose-heavy. 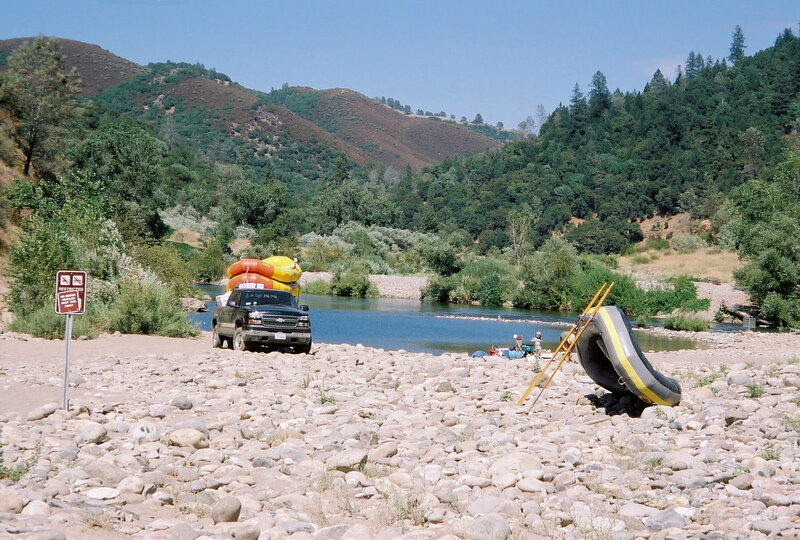 We plowed through most sets of rapids, getting swamped three times, but managed to paddle to shore to dump. I let my buddy take the back and steer and we promptly nailed a rock and ended up capsizing. Other than that, it was a walk in the park. This is beautiful country with several possible camp spots on the way. The run takes you fairly far from roads. The shuttle was not too bad, if you don't mind the 2 mile dirt road toward the campground down Driver's Flat road. 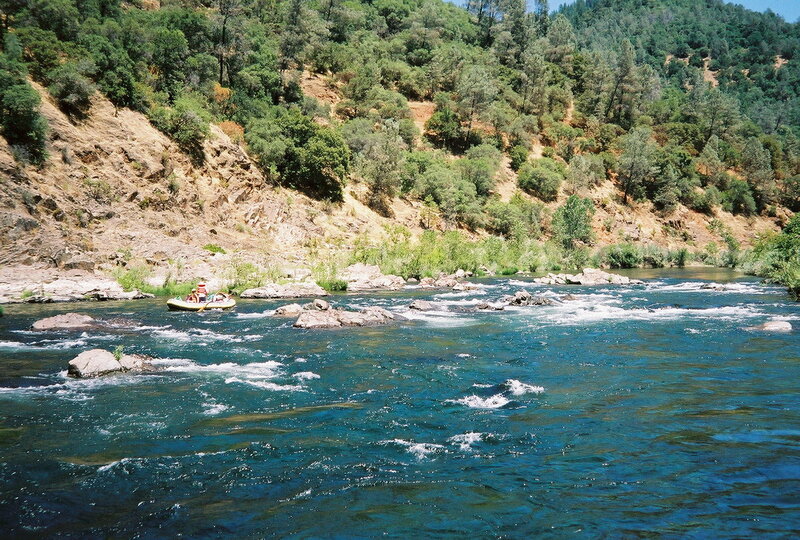 It was interesting in a canoe, but would be a bit tame for rafters compared to the upstream stuff. It would be a good kayak run for a confident beginner. We had a great time and will definitely do it again!